A year ago, my then 29 month old son was diagnosed with a PNET (Primal Neuroectodermal Tumor) in his brain stem, and it extended down, tentacle-like, into his spinal cord. He was given a 40% chance of survival. Very little of the tumor was removed, as it was so embedded within crucial parts of his brain and spine. It was about this time I found some fellow bloggers who’d participated in a St. Baldrick‘s event to raise awareness and donations toward pediatric brain cancer-and in honor of a lovely sprite of a girl taken too soon by brain cancer, Donna. Through their writing, I learned of Mary Tyler Mom’s blog, and Donna’s Cancer Story. I didn’t read Donna’s Cancer Story for many months. It was always there, waiting patiently for me to be ready. I was afraid of it, because I knew how it ended, and because it was my story, my son’s story. I began following Mary Tyler Mom’s blog and Facebook, and I learned of Donna’s Good Things. I found strength through Mary Tyler Mom’s ability to continue on after experiencing such tragedy. Today is Donna’s Day. It is a day meant for us in the pediatric cancer community to raise our voices and awareness for a much under-researched disease that is the number one killer of children over the age of one. Few cancer research organizations dedicate enough of their donations to pediactric cancer research. 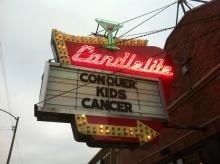 St. Baldrick’s is the only organization that donates all of their funds to ped cancer research. Besides using more of their funds for solicitation than for research, The American Cancer Society only allocates 1/2 cent of every dollar they do dedicate to research on ped cancer. There are St. Baldrick’s events nationwide, and several coming up in my city, New Orleans. Check out the link here. Show up or stay home, shave or don’t shave, but you can always help by clicking the donate button. Anything helps. Don’t feel like because you may not be able to donate a lot you shouldn’t. A little adds up to a lot. We are working hard, RB is working hardest of all, to rehabilitate and hopefully-one day-in the far or near future, we might move from Scarred Acres. Reading Donna’s Cancer Story has taught me the importance of choosing hope. We are making future plans. They may be castles in the sky, but one day my strong superhero Robot Boy might turn them into bricks and mortar. I’d like to leave you with this link to a sad yet heart-lightening video of Donna’s joyful moments.